The Chinese government has handed back to America the US Navy underwater drone it stole last week. The Seaglider submersible was scooped out of the ocean by a Chinese military vessel shadowing the USNS Bowditch in the South China Sea. The drone, one of hundreds of autonomous vehicles the US Navy uses to track currents and water salinity, was causing a hazard to shipping – according to the Chinese. The ensuing diplomatic incident led president-elect Donald Trump to issue a 4.30am tweet decrying the action. Trump was so annoyed he forgot how to spell – or created a new word to add to his bigly vocabulary. 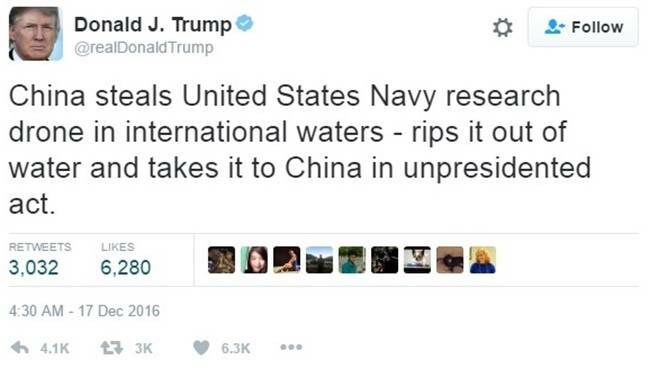 The Donald later tweeted again, telling China to keep the drone. After a round or three of negotiations, the Chinese have now given the unmanned underwater vehicle back to sailors on the USS Mustin at a meeting approximately 50 nautical miles northwest of Subic Bay, Philippines. "This incident was inconsistent with both international law and standards of professionalism for conduct between navies at sea," said Pentagon press secretary Peter Cook. The Navy will now investigate the drone to see if it has been tampered with and will be issuing a further report on the state of the equipment. Cook said the US would continue operating in the South China Sea as it always had. The incident was seen by many as a response to Trump's acceptance of a phone call from the Taiwanese premier. This was seen as an insult by the Middle Kingdom because it broke the "One China" policy, whereby countries deal with either China or Taiwan – but not both. Chinese Defense Ministry spokesperson Yang Yujun said that his government has examined the initially "unidentified device," and decided to return it. He said the US's "unilateral move to dramatize the issue in the process is inappropriate" and hadn't helped. "We regret that," Yang said, state media reports. He added that the US Navy had frequently invaded Chinese waters to carry out reconnaissance and military surveys, despite Chinese protests.